Momtastic used red jumbo rick-rack to add a decorative trim around the top and bottom of the shade. Looks great with the cobalt blue lamp base. Cyndy at the Creativity Exchange does a great job explaining how to update a lampshade with new patterned fabric. Shannon Berry Design Blog has a fantastic tutorial on creating a monogrammed lampshade with felt and fabric glue. I LOVE this. 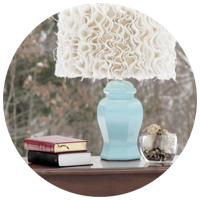 Marie Digby wrote a great guest post on Under The Sycamore and featured a very cool photograph lampshade. Mama Says Sew did a guest post at Tatertots and Jello showing us all how to make this fantastic ruffled lampshade out of burlap. If I had a daughter, this would be in her room. I hope these give you some great ideas to go revamp a lampshade of your own. I have an idea of what I’d like to do to mine and can assure you that the tutorial and pics are coming soon! What are some of the lampshade diy’s you’ve seen around?